Heavy snowfall covers Dillon Road in Upper Dublin Township, Montgomery County, during the nor'easter that hit the region on Friday and Saturday. This photo was taken about 8 p.m. Saturday. With snow accumulations already hitting 6 inches in parts of eastern Pennsylvania and northern New Jersey, forecasters upgraded to a winter storm warning on Saturday night. 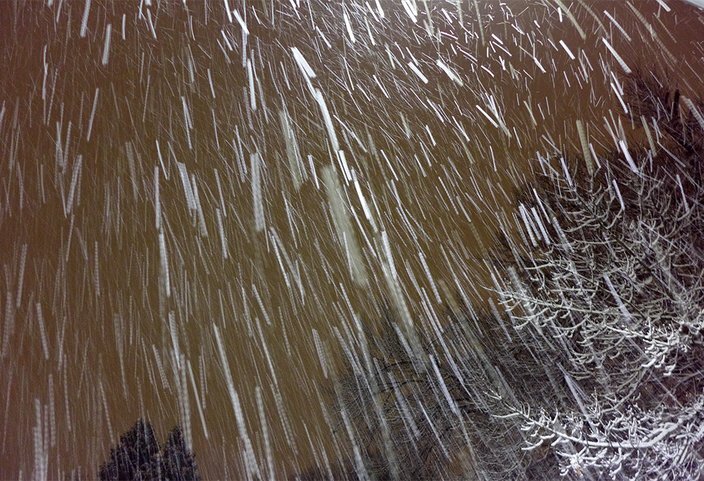 The snow was falling hard and heavy across much of the region, and expected to continue for several more hours. 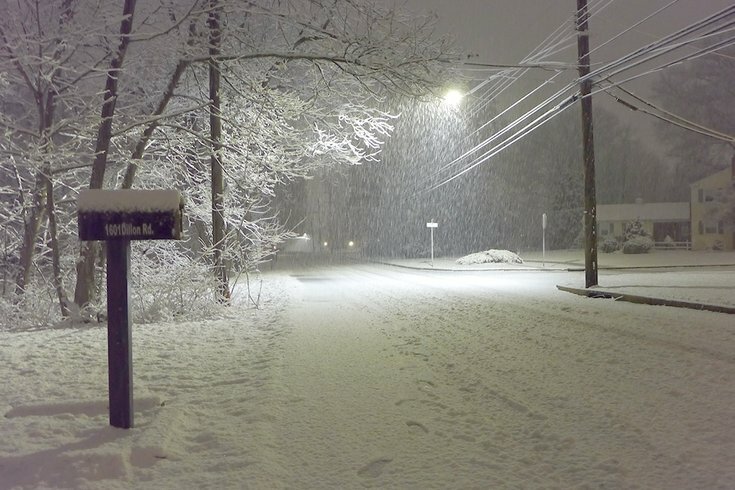 In the far north and west suburbs the snow could fall at a rate of 1-2 inches an hour. The storm warning is in effect until 4 a.m. Sunday. 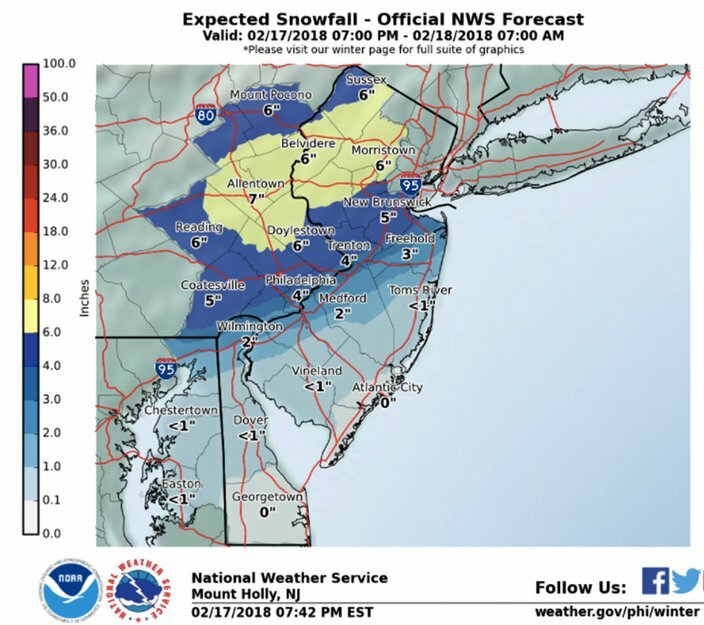 A rain/snow line could advance into the city of Philadelphia and central New Jersey in the late evening hours, and would cut into snowfall amounts in parts of those areas, according to National Weather Service. The quick-moving storm is expected to move out of the eastern portions of the region sometime around 1 or 2 a.m. The precipitation is already wrapping up in parts of Berks County to the west. Accumulations in the city look to be about 4 inches with as much as 6 inches in Doylestown, Bucks County, and perhaps a bit more north of there. Snow amounts look to be even higher in some locations. 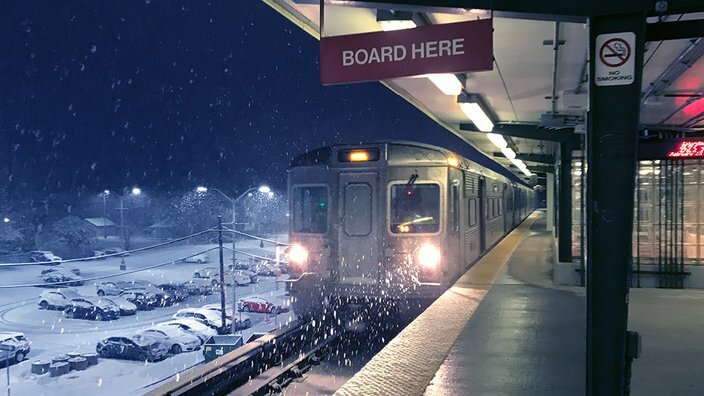 As the snow falls Saturday night, a PATCO train arrives at the Collingswood Station in Camden County. Before the precipitation began late Saturday afternoon as a very light rain in some places, forecasters said banding could be seen along the I-95 corridor. Forecasters warned that driving conditions on some roads in some locations could deteriorate quickly on Saturday night and become extremely slippery. Temperatures on Sunday will moderate, rising into the mid-40s to the newfallen snow. Temperatures will remain mild during the early part of the workweek, with rain showers likely Monday afternoon, and record warmth possible Tuesday and likely Wednesday. Saturday night: Rain, snow and freezing rain, possibly mixed with sleet before 3 a.m., then a slight chance of snow between 3 and 4 a.m. Low around 31. Calm wind becoming west around 6 mph after midnight. Chance of precipitation is 100 percent. Little or no ice accumulation expected. New snow and sleet accumulation of 1 to 3 inches possible. Sunday: Sunny, with a high near 46. Northwest wind 7 to 10 mph. Sunday night: Mostly clear, with a low around 31. Light and variable wind. Washington's Birthday: Rain likely, mainly after 1 p.m. Partly sunny, with a high near 49. Calm wind becoming south 5 to 7 mph in the morning. Chance of precipitation is 60 percent. New precipitation amounts of less than a tenth of an inch possible. Monday night: A chance of rain. Patchy fog after 1 a.m. Otherwise, cloudy, with a low around 48. Chance of precipitation is 40 percent. New precipitation amounts of less than a tenth of an inch possible. Tuesday: Mostly cloudy, with a high near 70. Tuesday night: Patchy fog after 1 a.m. Otherwise, mostly cloudy, with a low around 58. Wednesday: Mostly cloudy, with a high near 75. Wednesday night: A chance of showers. Mostly cloudy, with a low around 49. Chance of precipitation is 30 percent. Thursday: A chance of showers. Mostly cloudy, with a high near 55. Chance of precipitation is 40 percent. Thursday night: A chance of showers. Mostly cloudy, with a low around 40. Chance of precipitation is 30 percent. Saturday night: Snow, mainly before 3 a.m. Low around 23. Light and variable wind becoming west 5 to 9 mph after midnight. Chance of precipitation is 100 percent. New snow accumulation of 2 to 4 inches possible. Sunday: Mostly sunny, with a high near 43. Northwest wind 9 to 16 mph. Sunday night: Mostly clear, with a low around 20. Calm wind becoming south around 6 mph after midnight. Washington's Birthday: A chance of rain and sleet before 1 p.m., then rain likely. Mostly cloudy, with a high near 46. South wind 8 to 11 mph. Chance of precipitation is 70 percent. Little or no sleet accumulation expected. Monday night: Rain likely. Patchy fog after 1 a.m. Otherwise, cloudy, with a low around 42. Chance of precipitation is 60 percent. New precipitation amounts between a tenth and quarter of an inch possible. Tuesday: Patchy fog before 10 a.m. Otherwise, cloudy, with a high near 62. Tuesday night: Patchy fog after 1 a.m. Otherwise, mostly cloudy, with a low around 53. Wednesday: A chance of showers after 10 a.m. Mostly cloudy, with a high near 66. Chance of precipitation is 40 percent. Wednesday night: A chance of showers. Mostly cloudy, with a low around 38. Chance of precipitation is 40 percent. Thursday: A chance of showers. Mostly cloudy, with a high near 43. Chance of precipitation is 40 percent. Friday: A chance of rain and snow showers. Mostly cloudy, with a high near 43. Chance of precipitation is 50 percent.